Imagine you’re in northern Mexico in the Free and Sovereign State of Chihuahua on a mild November day. Now imagine you’re deep underground, traversing a cavern of enormous crystals and dressed in an orange suit, helmet and respirator blowing ice-cooled air. And that under the orange suit is a double vest, filled with rows of ice packs. Finally, add heavy duty gloves and boots. Well, that’s what we did today – simultaneously the most terrifying and mind-blowing exercise I’ve ever entered into voluntarily. With temperatures close to 58 degrees Celsius, the Cueva de los Cristales (Cave of Crystals) attached to the silver and lead mine at Naica is completely otherworldly. 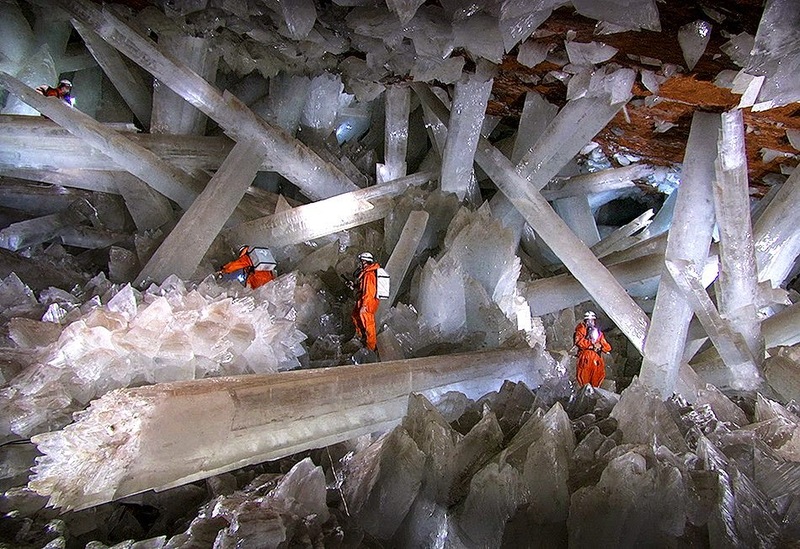 Immense selenite crystals grow like crazy in the overheated atmosphere – some 12 metres long and weighing over 50 tons. Descending through the earth, the temperature and humidity increasing to almost unbearable levels even in our suits, all I wanted to do was get out of there as quickly as possible.